Alhazen was a believer in the scientific method. "Prove what you believe!" Well, it is impossible to prove what I believe when NASA will not perform the experiments that would prove what they apparently believe, and which they have lead everyone else to believe as regards to what is visible to the human eye from space. I have made many enemies amongst the mainstream purveyors of scientific 'fact' by asking them for proof of their claims. This has lead to being banned from most of their web sites, or having questions deleted, hidden from view by some devious practices, or simply ignored. As the words of the astronauts who have been to deep space do not seem to be believed, perhaps it would be possible then to use the scientific information that has been collected from some space based missions to scientifically and mathematically prove that from outside of Earths atmosphere our eyes would not be able to see the stars, planets, or even the Sun? I have embarked then on the task of using the Galileo mission spacecraft and the Solid State Imager that it carried in an attempt to show that the number of photons captured by the device in a given time would not be sufficient to produce the conscious awareness of any of the objects it detected due to an insufficient photon flux, and based on scientific experimentation which have determined the minimum number of photons required. I have chosen the Galileo ISS as it was the first solid state imager to be sent out into the void, there are technical descriptions of its functions and capabilities, and the raw data from the mission is available online. Already it is apparent that it is not such a simple task. The data is in a format that does not allow it to simply be downloaded and viewed with readily available software. As well as the image files, many gigabytes of calibration files must be downloaded and incorporated in order to make the images usable. To begin with I will be looking at some of the early mission images, obtained when Galileo was still in close proximity to Earth and undergoing testing and calibration, and viewing the Earth, Moon, and Venus. The first images I will be attempting to decode are of the Moon as I see from the data file information that an 8 second exposure was used for some of them. This is a very long exposure for such a sensitive instrument when my old digital camera EXIF file shows a 1/120 sec exposure at ISO 100 to properly capture an image of the full moon. 8 seconds with the SSI would surely show a washed out Moon and some stars in the Lunar background? My investigations so far have also raised some questions about the use of the Moon as a calibration light source for Earth orbiting spacecraft that are looking at the Earth from a high orbit, but seem unable to show us images of the Moon from such orbits. Had Alhazen been around today, I think he too would have been demanding the science and experiments required to offer proof of what we are being told about the visibility of the heavens from outside of Earths atmosphere. When I was checking the OSIRIS-REx page I spotted two images that are similar to what you are talking about. When you finish looking at the shots from Galileo SSI, you might look into OSIRIS-REx as well. On October 2, 2017, the MapCam instrument on OSIRIS-REx captured the data for a composite image (above) of the Earth and Moon. The spacecraft was approximately 5 million kilometers (3 million miles) from Earth at the time, about 13 times the distance between the Earth and Moon. (Click here to see the geometry of the shot.) Three images (different color wavelengths) were combined and color-corrected to make the composite, and the Moon was “stretched” (brightened) to make it more easily visible. The spacecraft was approximately 3,370,000 miles (5,420,000 km) from the Moon and 3,180,000 miles (5,120,000 km) from Earth—or about 13 times the separation distance between the Earth and Moon. At that range, both planetary bodies could be captured in the same frame. That could be a long, long time away. I have followed the instructions for using the img2png program that converts the Galileo images to a format that can be viewed with software such as Gimp, but results so far are less than satisfactory. I will be contacting the programs author, Björn Jónsson, to see if he can offer some advice. He has a web page where he shows some of his image processing efforts. 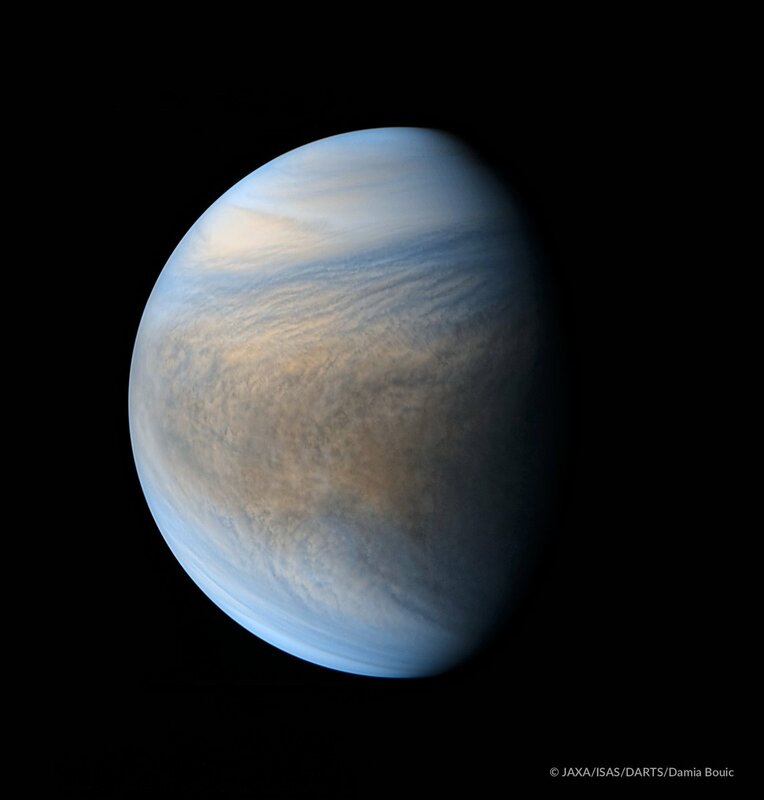 Akatsuki has IR and UV cameras, and a visible light sensor for trying to detect lightning in the Venusian atmosphere, but not a conventional visible light camera. The images of Earth and Moon from a distance then are only possible IMO due to the extreme sensitivity of the instruments and much processing by software. I will put up a web page sometime that looks at all aspects of this subject, from the CCD capabilities to the ISO rating of the human eye, it really is a complex affair. For myself I am satisfied with the reports from the astronauts that nothing was visible, but was hoping to be able to prove it scientifically from the data available, but it is an extremely difficult and convoluted process, but I'll give it my best shot. This is the video that Tesla put out from the car they put in space. The first four minutes are from inside the car. I have not watched all four plus hours yet but they have many views of space from the car. No stars visible. At 9 minutes, the Earth appears again. OMG! I need to harvest the video and watch it all. Deeply disturbing, on many levels. HA! - Is the car going to be ticketed for speeding. - What happens if the car runs into something. Will insurance cover it. Not all cameras will be capable of imaging the stars in real time, though I have seen a few on tv shows where the video camera has picked up the stars. What about the Moon, or Venus? Should easily pick those up. Depending on the range of the transmitter on the craft, it would be interesting to me to see if the car or astronaut are visible once away from Earth, as it should be totally black out there according to the Apollo astronauts. Looking rather dark already towards the end the end of the video?. The batteries in the Tesla would be flat after 12 hours according to Musk so no more video of the trip. Should have used a radioisotope thermoelectric generator. GaryN..What about the Moon, or Venus? My guess is dust particles reflecting the Sun. The particles are moving way too fast otherwise. That's similar to the Mercury? program when one of the astronauts got into trouble for reporting the stuff floating around him. He got too excited about it. HA! The video simply burns my brain. The dust particles are seen because the camera auto-white-balance adjust for the lighting condition as the Earth moves out of the frame. Seems to be a very dusty place though. The movement of the shielding I can't explain. Wind? But it seems pretty common in a lot of videos of various things orbiting. Yes, It appears on the left side of the screen, then a minute later it is on the right. The video fosborn_ posted above has the few times that the Moon appears. Also, someone mentioned that there is a towel in the glove compartment to go with the "Don't Panic!" statement on the control console. Plus, you can see a toy on the dash. I can't tell what it is. Also someone put the start of the movie Heavy Metal with the Tesla car to show that inspiration. This is still deeply scary. HA! It's a Hot Wheels 2008 Tesla roadster, with a miniature astronaut, so I'm told. I hope Musk can continue bringing a little light-hearted touch to space adventure. NASA has become so incredibly boring, claiming all the time that space is a really dangerous environment, no place for fun. And no time for frivolous experiments by the EVA astronauts that could answer a few very important questions. I have also being trying to find out what cameras were used for the images, no reply yet. There is already a Wiki page collecting all of the details. HA!